There is a broad range of dining options on St. Croix from island cuisine to Chinese, from fast food restaurants like KFC, MacDonald's and Pizza Hut, to very fine dining. As a result of a diverse, ethnic community, St. Croix has it all! Although you may want to do some cooking at Caribbean Breeze & Villa Dawn and dine either inside the villa or condo, or outside on the patios, you'll probably want someone else to do most of the cooking for you! You can have a personal chef cook for you at the house or prepare your meal and deliver it all packaged and ready to eat! 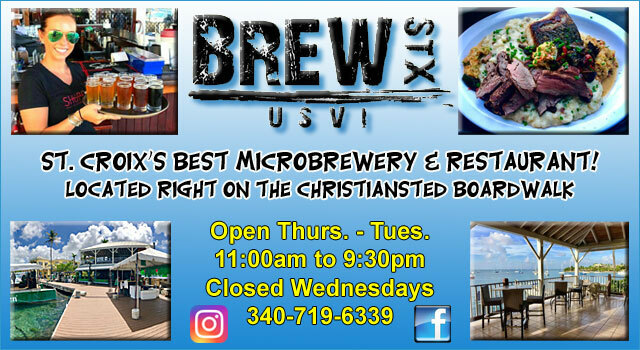 The following pages list many of St. Croix's restaurants for you to choose from. 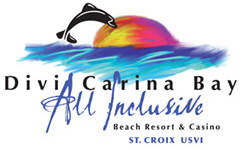 Click on the following restaurants or regions of St. Croix for more detailed information. Email us a review of your favorite St. Croix restaurant and we will include it on this web page. Click to send us your restaurant review! 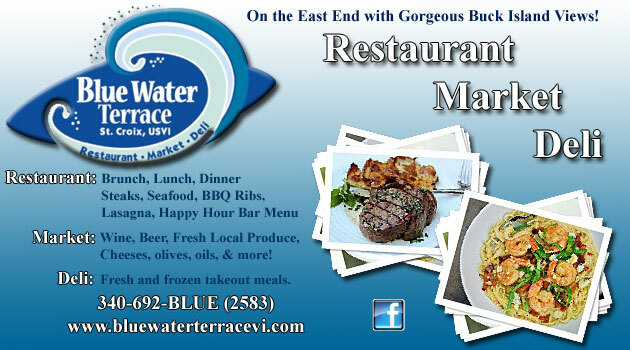 Blue Water Terrace - 340-692-2583 - Restaurant, Market, Deli. Great food with a spectacular view of Buck Island. Located on the east end. Don't miss this place! 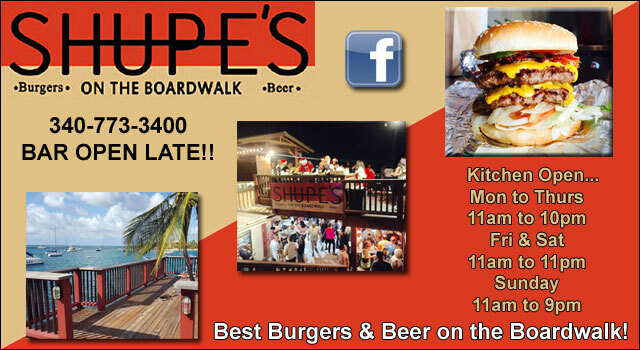 Duggan�s Reef � 340-773-9800 - Seafood, steaks, salads, waterfront with a nice beach. Bubble Makers - 340-719-7201 Mobile: 340-277-6219 - Full Service vacation planning and event services. Dashi - 340-773-6911 - Specializing in Sushi. Singhs Fast Food - 340-773-7357 - West Indian/Caribbean fast food. You Are Here Bar & Grille - 340-713-0246 - great menu options including The Best Pizza on the Island! Zion Modern Kitchen - 340-773-ZION - simple food. quality sources. made with love. 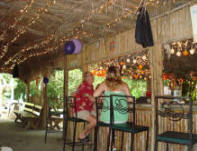 Breezez Beach Bar - 340-773-7077 - Seafood, salads, pastas, prime rib, brunch, etc. Seini's Golden Rail At Mill Harbour - 340-719-1985 - Breakfast, lunch, and dinner. Lost Dog Pub 340-772-3526 - Pizza, pasta, Sports Bar, open late everyday, 4pm - 2am. Montpellier Domino Club - 340-713-9052 - In the Rain Forest, this is a must see! Feed the "Beer Drinking Pigs"! Rythyms at Rainbow Beach - 340-772-0002, Burgers, wings, salads, fish, right on a beautiful beach! Off the Wall Bar and Grill - 340-778-4771 - Pizza, Sandwiches, Salads, Specials, etc. Open daily from 11:00 a.m. to 9 p.m. VISA & Mastercard accepted. Rowdy Joe's - 340-718-0055 - by the corner store. Great food, wireless Internet, watch your favorite sports, homemade ice cream. Spratnet - 340-719-8485 - Classic beach bar at Cane Bay Beach. Food & drinks, live music. The food, water view, ambiance and affordable prices of this restaurant located in St. Croix�s town of Christiansted makes this one of the island's favorite restaurants. Angry Nates is housed at the Holger Danske Hotel, right on the boardwalk. Local fishermen bring us the catch of the day including Tuna, Wahoo, Mahi Mahi and fresh Lobster. Our menu includes traditional American fare with fresh Caribbean flavors as well as daily specials that include but are not limited to Thai, Spanish and Mediterranean. Dine among local artwork, watch the boats and seaplane come and go from our waterfront dining room. We serve breakfast, lunch and dinner seven days a week and offer affordable prices with a beautiful view. Reservations recommended during high season. 1-340-692-6283. Open daily 8am - 10pm. Join us for Sunday Brunch! It�s safe to say Angry Nates is not more of the same ole' same ole'! 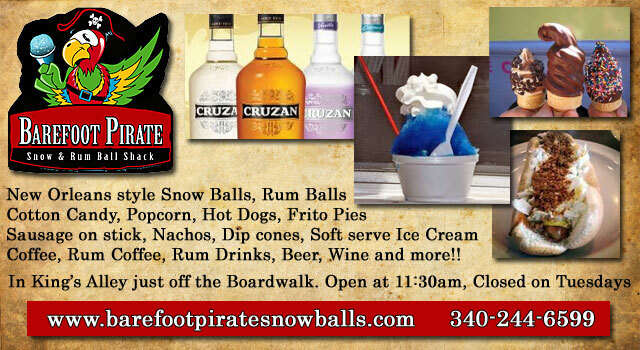 Barefoot Pirate - 340-244-6599 - New Orleans style Snowballs, Rum balls, Cotton Candy, Popcorn, Hotdogs, Sausage on a Stick, Nachos, Dip Cones, Soft Serve Ice Cream, Coffe, Rum Coffee, Rum Drinks, Beer, Wine,and more!!! Bombay Club - Steak, Chicken, Seafood, Pasta, and more, 340-773-1838 (this is not Indian food as the name suggests) MC, VISA. Harvey's - 340-773-3433 - local Caribbean food, mutton stew, curried goat, fish cakes, pates. Don't leave St. Croix without trying some "real" local food...give it a try! Don't be afraid to go on in...the prices are great, the people are friendly and the food is wonderful. 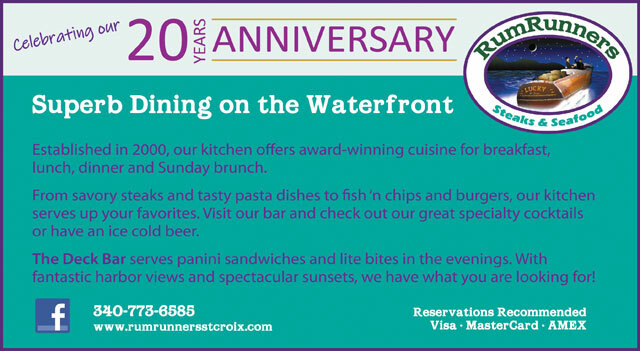 Rum Runners - 340-773-6585 � Continental, Prime rib and steaks, choose your own Lobster, Seafood - Located waterfront at Caravelle Hotel in the center of Christiansted boardwalk. Open for breakfast lunch and dinner 6 days a week, Sunday brunch 10 - 2, Happy hour 4 - 6 PM. Reservations appreciated, all major credit cards accepted. 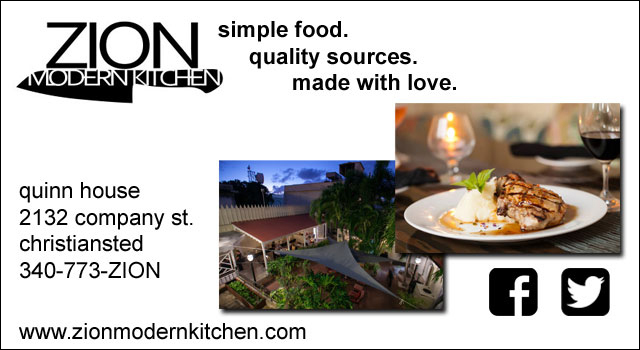 Zion Modern Kitchen - 340-773-ZION - simple food. quality sources. made with love. Our Mantra-Whether it's served on fine china or on a paper plate food brings us together and stimulates conversation. 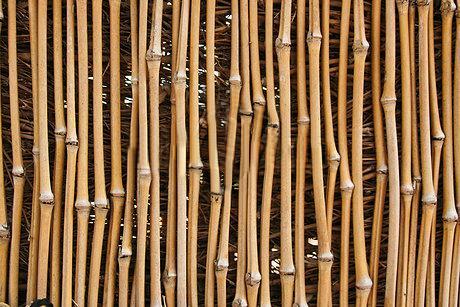 We feast to wed, mourn, celebrate, strengthen friendships, and simply to be hospitable. Good eating is one of life's great pleasures. Vegan options available. Open Wednesday - Sunday, 5-10pm, reservations recommended. Blue Water Terrace - 340-692-2583 - Restaurant, Market, Deli. Great food with a spectacular view of Buck Island. Located on the east end. Don't miss this place! All you can eat Seafood Bake Mondays 5-9pm. Award winning Brunch every Sunday from 10am to 2pm. Serving dinner starting at 5pm. Open 6 days a week, closed on Wednesday. For regular menus and more information check out our website or facebook page. The Mermaid is located beach side, at the Buccaneer Resort, with an extensive menu of savory seafood and specials, soups, salads and sandwiches, and gourmet meals that include all-American favorites, island specialties and vegetarian. There is also a full bar, including frozen island favorites and vintage cocktails. Cheeseburgers in America's Paradise - Great burgers, burritos, chicken sandwiches, chili dogs, nachos, chili, steaks, salads plus daily specials that include fresh fish and pastas. For dessert try our homemade rum cake, key lime pie and brownie ala mode and delicious soft serve ice cream. Enjoy your meal with your favorite beverage from our full bar. A very popular place with tourists and locals alike. There is live music Thursday thru Sunday. Only a 10 minute drive from historic Christiansted. 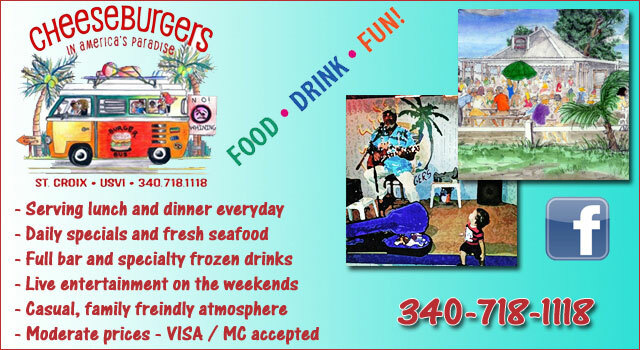 Wait till you have one of our burgers while listening to some fun island music! seven days a week for lunch and dinner. 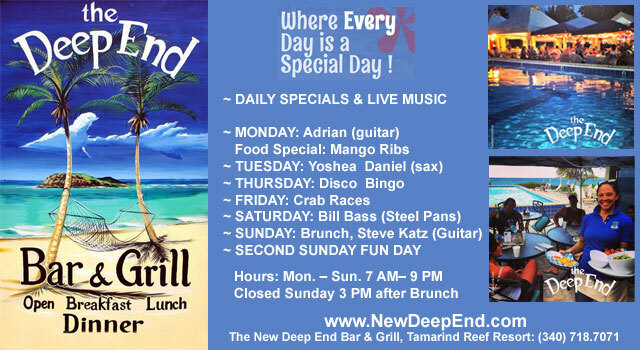 Deep End Bar and Grill � 340-773-4455 - Beach bar at the Green Cay marina. Burgers, sandwiches, soups, salads. Locals and tourists agree that Deep End is a fun place to be! AX, MC, VISA, DC. The Starlite Grille serves breakfast daily against the breathtaking views of Carina Bay. Casual dining is available at the Dockside Caf� and Deli - a colorful, market-style setting just steps from the beach. The Dockside Caf� serves breakfast, lunch, light snacks and dinner daily. On Thursday nights, enjoy our Caribbean Beach Bar-B-Que which hosts local cuisine, vendors, and live music. A new restaurant is now open to satisfy those Italian taste buds. East End Pizza is an open-air pizza restaurant serving pizza, calzones, panini sandwiches, and a variety of salads and appetizers Wednesday thru Sunday. Sai Gon Deli - 340-713-1111 - Handmade Vietnamese Food on St. Croix. 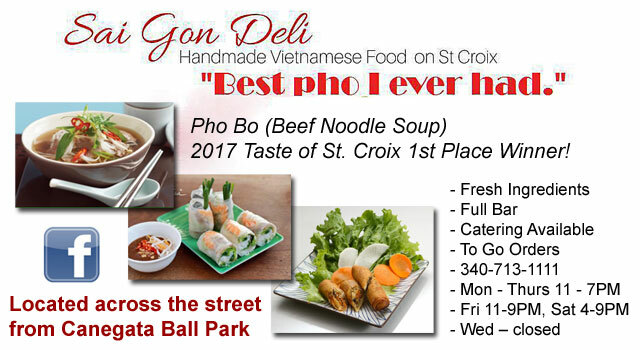 2017 Taste of St. Croix Winner for Pho Bo (Beef Noodle Soup)! Fresh Ingredients, Full bar, Happy Hour Mon to Wed 4-6pm 50% Off drinks and food discounts, Catering available, To Go Orders. Located across the street from Canegata Ball Park. Open: Mon-Thurs. 11-7pm, Fri. 11-9pm, Sat 4-9pm, We are closed on Wed.
Seini's Golden Rail at Mill Harbour- 340-719-1985 - Breakfast, lunch, and dinner. 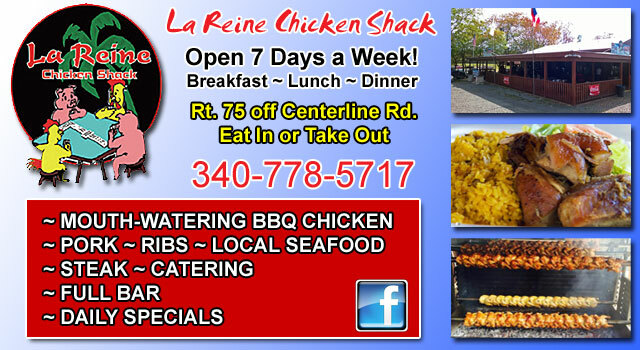 La Reine Chicken Shack - 340-778-5717 - Open Pit BBQ Chicken, Ribs, Steaks, Local Seafood, Open 7 days a week, breakfast, lunch and dinner. Rt. 75 off Centerline Road. 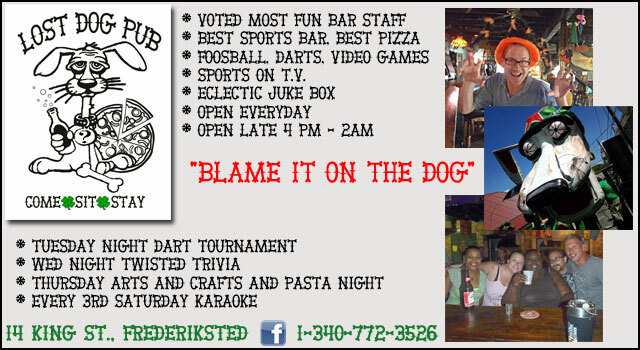 Lost Dog Pub - 340-772-3526 - Voted most fun bar staff, best sports bar and best pizza on the island! Besides our delicious pizza and other menu items we have Foosball, darts, video games, sports on TV and an eclectic juke box. Check out our specials. Open everyday, from 4pm - 2am. located one block back from the water front at 14 King St., Frederiksted, St. Croix. Come - Sit - Stay! 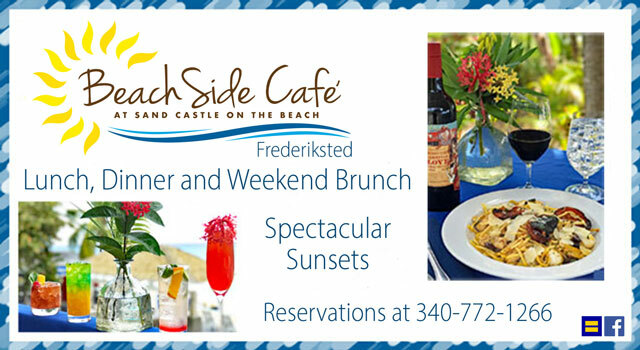 Beachside Cafe at Sand Castle On The Beach - 340-772-1266 - Soups, salads, seafood, poultry, pasta. Enjoy your dinner with one of St. Croix's best sunsets! Gay friendly restaurant and resort. VISA, MC and Travelers Checks accepted, Reservations recommended. Montpellier Domino Club - 340-713-9052 - Located on Route 76 (Mahogany Rd.) in the rainforest. Great food, drinks and entertainment. Home of the famous "Mama Wanna" and the beer drinking pigs! Daily food special. One of the coolest bars you will ever see! Norma, the bar's owner, is always there with a big smile and some great home cooking. Try the sweet & hot sauce with some of her chicken. On Wednesdays and Thursdays, she makes some of the best burgers anywhere. Each day Norma cooks something absolutely delicious to eat!